Tony Curtis gives a winning performance as the great Houdini, the struggling circus performer who emerged as the world s most captivating magician and escape artist. From his beginnings as a wild man carnival act to the internationally famous feat of escaping from a locked trunk in an ice-jammed river, Houdini effectively captures the amazing life and courage of this fascinating man. Also stars the beautiful Janet Leigh as Houdini s supportive wife who lovingly stood by his side throughout his legendary career. If there’s one type of film that Hollywood does extremely poorly, it’s the biography. Whether it’s virtually any biography done by Oliver Stone, or biographies about Buster Keaton, Capone, etc. Hollywood tends to take enormous liberties with the facts in order to make a more entertaining movie. 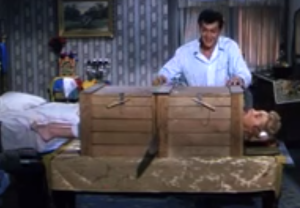 Nowhere is that truer than in Houdini, starring Tony Curtis and Janet Leigh. On the one hand, it’s a very entertaining film, with good performances by the lead actors. It’s also noteworthy in the film’s attempts at duplicating some of Harry Houdini‘s great escapes. In fact, producer George Pal did no camera tricks. The actors actually learned how to perform the various illusions. However, beyond that, it takes enormous liberties with events in Harry Houdini‘s life, including totally changing how Houdini died. It’s because of this movie that many people have the false impression that Houdini died attempting his water torture escape. When all’s said and done, Houdini is an entertaining film. Provided that the audience knows that it’s 50% (or more) fiction mixed in with fact. I rate it 2 stars out of 5. Tony Curtis will amaze and astound you with one of his best performances as Harry Houdini, “the man of 10,000 tricks.” Houdini has nothing up its sleeve, but the charismatic Curtis and Janet Leigh (“Hollywood’s Most Exciting Young Lovers,” proclaims the film’s original trailer, the sole bonus feature on this disc), as Houdini’s wife, Bess, levitate this conventional, albeit enormously entertaining 1953 biopic that follows the legendary magician and escape artist from his days as a sideshow attraction to international stardom.